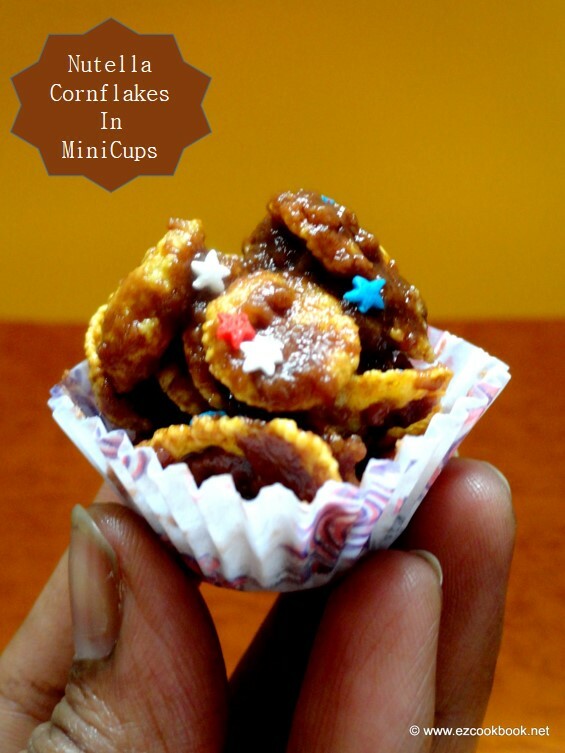 Do you believe that these cute cookie cup are really hit with my lil one. She loves it and even helped me with her little hands. Yes this is a kids friendly recipe, so engage your lil ones to assist you to make the recipe. All you need to prepare this easy dessert in just 4 ingredients - corn flakes,butter, honey, nutella. And it takes only 10 - 15 minutes to get done. A perfect party dessert I can suggest. It was a hit to my daughter's class party at school. 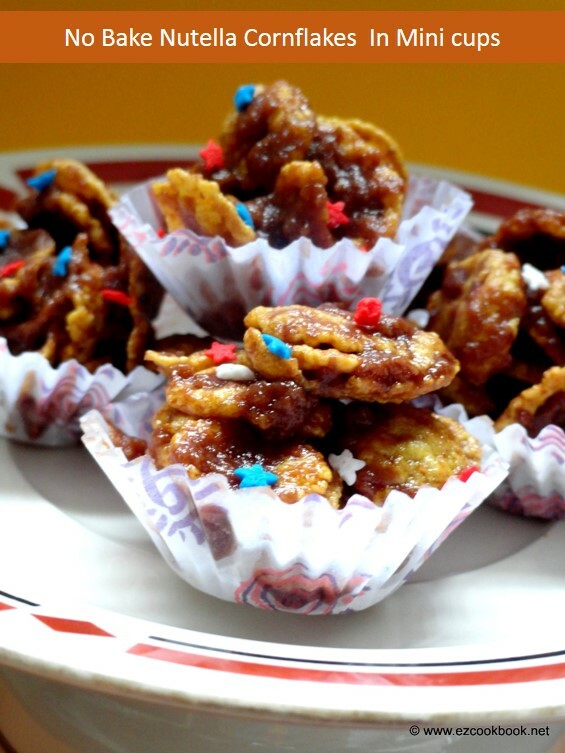 Who don't love to eat chocolate dessert, that too with crispy cornflakes. You can simply substitute nutella with any dark chocolate or coco powder as desire. It was actually in my long way to do in list. Everything makes sense when time occurs. Finally I made it. * Substitute chocolate or choco powder for Nutella, if you don't have in hand. * Aslo try half chocolate and half nutella combination. 1.Melt the butter in microwave safe bowl for 10 secs or in a sauce pan using stove top. Mix nutella and honey with butter. 2.Measure about 1 cup of corn flakes (use kellogg's or nestle). Add this to the nutella mix. Stir gently to combine well and don't break the corn flakes. 3.Spoon the mixture in a mini cups. Arrange in a tray, allow it to set in refrigerator for 30 minutes. Serve chilled as a dessert. Perfect for party time, especially Kids birthday!! I added few edible cake sprinkles to garnish before serving. For variation, try with some dry fruits and nuts, while spooning the mixture. Also try with chocolate instead of nutella with sugar or golden syrup. thats a cute idea ! well work for kids bday ! Is it possible to leave the corn flakes out in the open after its set in the fridge after 30 minutes? Also, is it possible to replace honey with maple syrup?